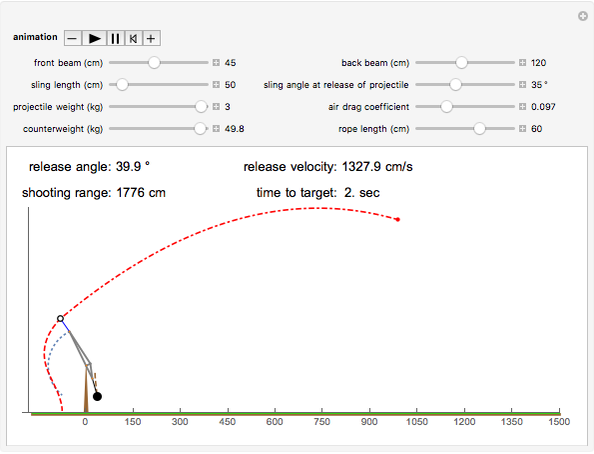 Phase 1: The projectile is inside the pouch on the sling of the trebuchet and follows the equations of motion used in the Demonstration listed in Related Links. It is based on the method described in . 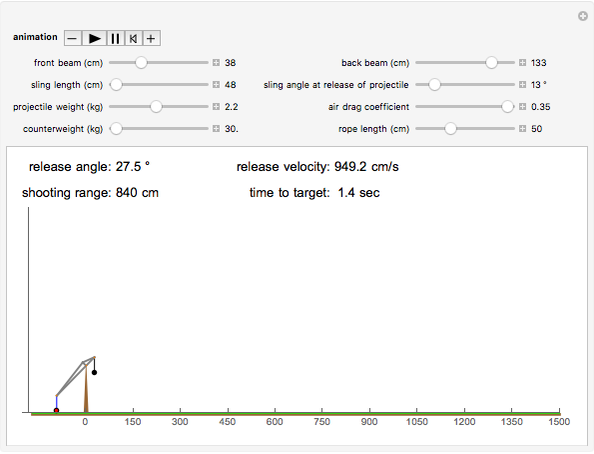 Phase 2: After release from the trebuchet sling's pouch, the projectile follows a ballistic path subject only to gravity and air drag. The equation of motion of this part is described in . D. B. Siano. "Trebuchet Mechanics." (Mar 28, 2001) www.aemma.org/training/trebuchet/trebmath35.pdf. Wikipedia. "Trajectory of a Projectile." (Dec 8, 2015) en.wikipedia.org/wiki/Trajectory_of_a _projectile.